I’m back and ready for action. The Mission Mindset is completely revamped and ready to help your productivity. Now get out there and take control of time. “Productivity gurus” are constantly telling you the newest tip you have to try. Turns out these “tips” usually aren’t practical for average people with full schedules. We’re too busy with school, work, kids, and just trying to keep up with day-to-day activities. Life doesn’t seem to be slowing down any time soon. As a matter of fact…it gets busier each day. But, that doesn’t mean we can’t live happier and more productive lives. 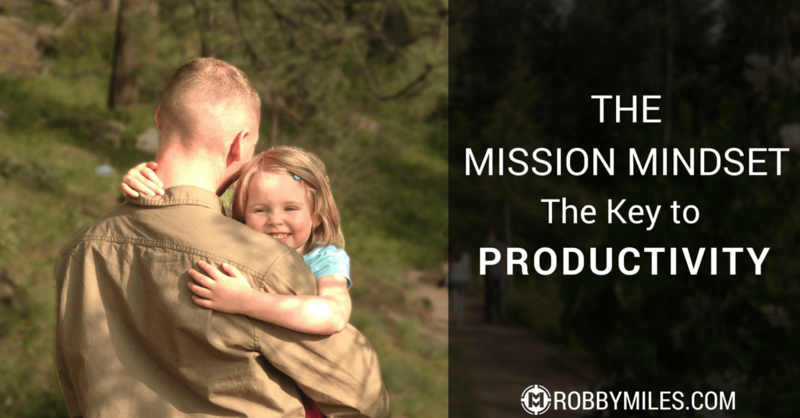 My name is Robby Miles, and I’m a husband, a dad, a college prep teacher, a freelance writer, an Officer in the Army National Guard, and founder of the Mission Mindset. Needless to say…I’m busy. But I fit it all in, and still have time for faith and family. I’m just an average guy trying to take care of a family. If I can do it, you can too. My goal is to help you use practical systems to create focus for the missions that matter. So what makes the Mission Mindset different? I’ve tried countless productivity tricks and systems by the “experts.” But most of them simply weren’t practical for a busy, married, father of four. They are designed for single people who only have to worry about their job, their social life, and maybe their cat. The systems ended up being some lofty ideal instead of something doable. I had to go back to the fundamentals, build habits, and take small steps each day. In the end, productivity needs to be so simple we don’t even think about it. I’m from North Idaho. Up here productivity means getting the right things accomplished. And this can only be done through simplicity and focus. I’ll take you through a time-tested process to streamline your day-to-day activities and create focus for the missions that matter. Each week you can expect an email with practical strategies you can use right away to accomplish your missions. Sign up below and I’ll send you these five templates and strategies. Sick of feeling busy and overwhelmed? Get 5 templates and systems to create focus, overcome distraction, and get back hours of quality time each day.